In the mid-2000s, as Bates worked with architect Sasaki Associates on plans for a new dining facility, it was up for grabs whether Bates would continue with its distinctive tradition of a single dining hall where everyone dines under one roof. But during their campus interviews, the architects heard a common response from students, faculty, and staff. They wanted one Commons. “The traditional model still held,” says Christine Schwartz, assistant vice president for dining, conferences, and campus events. A version of this story appeared in the Fall 2015 issue of Bates Magazine. Bates didn’t always have a single dining hall. The college once had two, one for men and one for women, until 1967, when dining became coed with the closing of the women’s dining hall in Rand Hall. 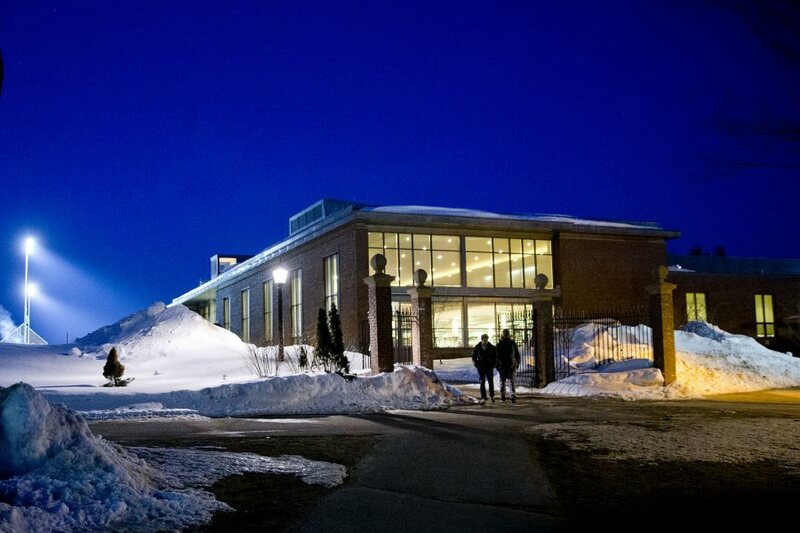 From then until 2008, Bates’ single dining hall was Memorial Commons, in Chase Hall. In February 2008, the new Commons building opened. Located between Garcelon Field and Alumni Gym, at the terminus of Alumni Walk, the 60,000 square-foot structure is clad in brick, granite, slate, copper, and ample glass. In the collegiate gothic style, “it is not a hip, swinging building, but it is great complement to the Bates campus, and it has enormous architectural integrity,” said the late architectural critic and author Philip Isaacson ’47. The Commons dining operation comprises one large dining hall plus two smaller dining rooms and a mezzanine; a multi-platform servery; kitchen and storage space; and office space. Showcased as case study in sustainability. 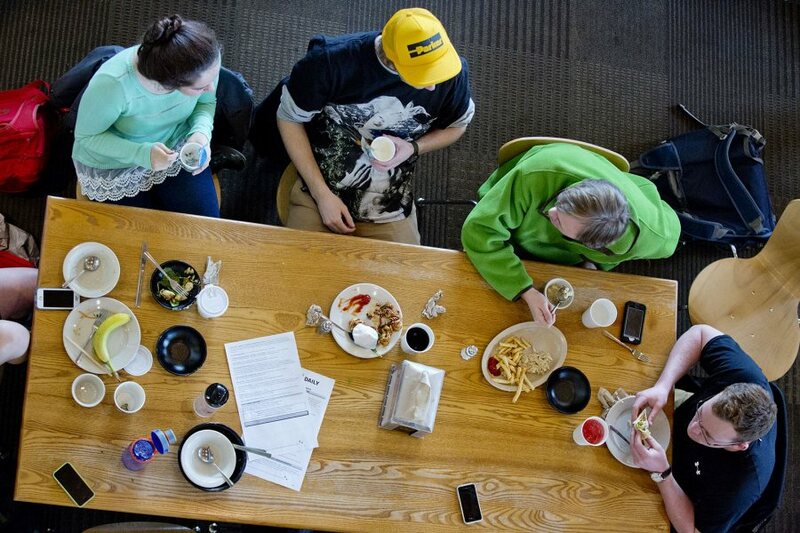 Long a leader in sustainable dining, in 2013 Bates Dining earned a third star for sustainability from the Green Restaurant Association, joining just a handful of U.S. colleges or universities with the rating. Earlier this year, the nonprofit Farm to Institution New England showcased Bates as a case study in sustainability. It’s also distinctive that Bates runs its own dining operation rather than outsourcing to a commercial food service. 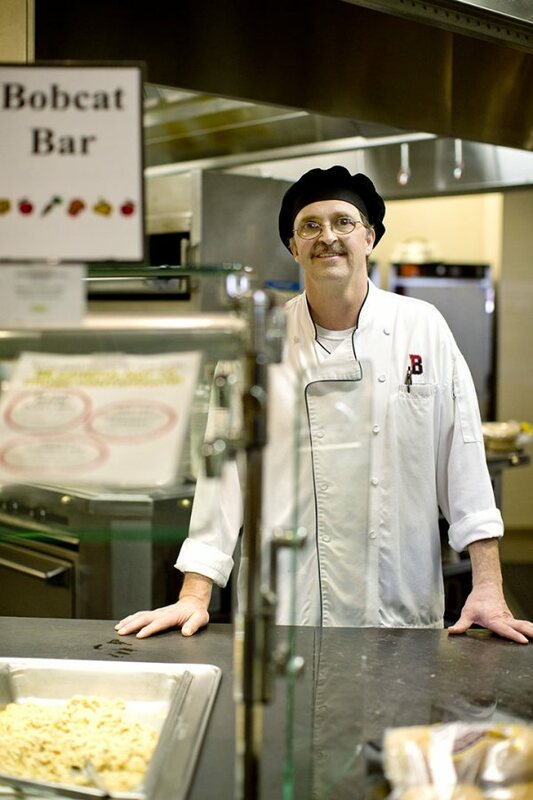 With some 90 employees, Dining Services serves more than 4,800 meals every day of the academic year to 1,700 students. As they’ve turned a building into a community-builder, Schwartz and Director of Dining Cheryl Lacey recently talked about both the simple lessons they’ve learned (such as “never install any shelving that’s higher than your shortest employee!”) and the big ones. As Bates planned its new Commons, Schwartz used the impending change as a catalyst for professional development among her staff. The plan paid off in staff satisfaction. Longtime servers moved into the kitchen, dishroom workers moved to the bakery, and so on. “In some cases, this was the first time in their lives that someone asked them, ‘What do you want to do?’” says Schwartz. Some fads persist, like the latest fad: Reddi-wip. Recent napkin comments suggest that hot sauces are, well, hot. 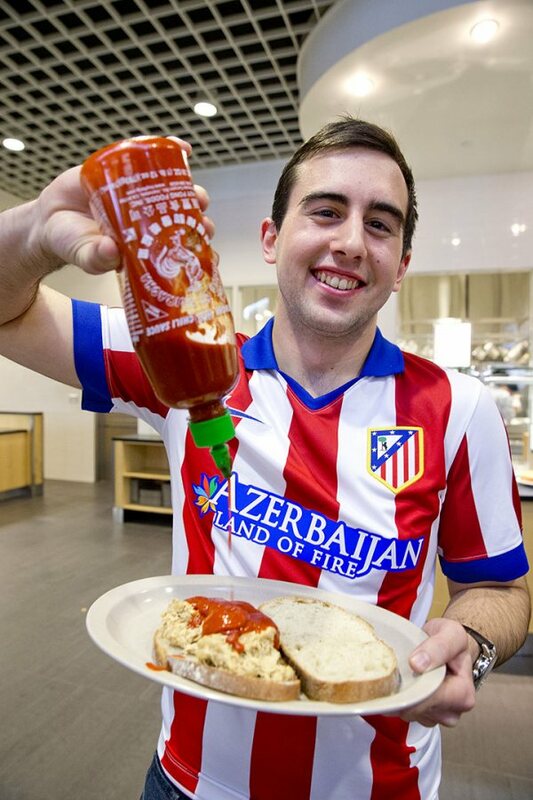 Frank’s and Tabasco were big; now it’s Sriracha and Tapatio. And students, surprisingly, “seem to be connoisseurs of fake maple syrup,” Lacey says. “Some requests are important today and gone tomorrow,” she says. “But some persist, like the latest fad: Reddi-wip.” Cereal tastes change, too. Lacey just finished a survey that shows a new favorite, Fruit and Yogurt Special K.
The servery features a marketplace model, where students take their food from one of several platforms — the Round, with a deli, brick oven, and salad and pasta bars; the Bobcat Bar, featuring a range of hot dishes, including the famous shepherd’s pie; plus the Bakery, Grill, and Choices, for alternatives such as gluten-free foods. The flow of diners to and from the platforms is fluid, easily handling 500 students in a 30- to 45-minute period. “Combine that with open seating areas on two levels, and you have a very appealing dining environment,” Schwartz says. 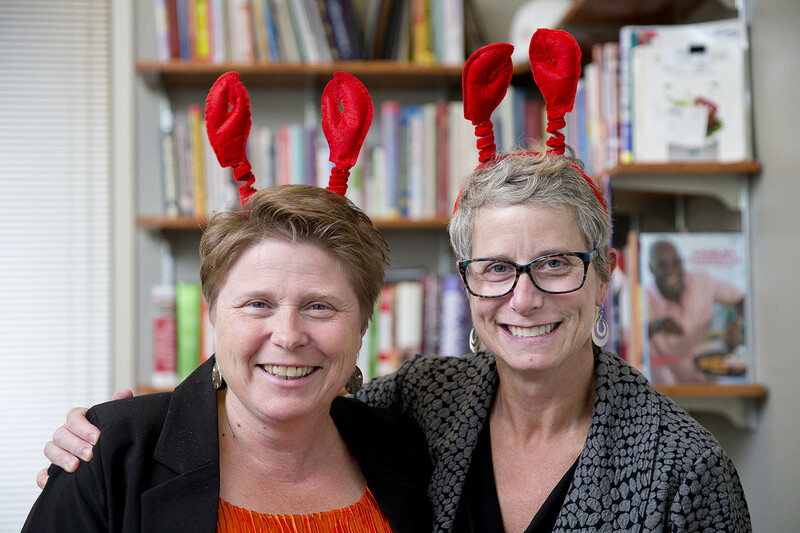 Commons is a place to feed intellectual curiosity as well as the body, and Bates Dining gets valuable help from students and faculty who wish to conduct dining- or food-focused projects. “We live for this sort of thing because it allows us all to be part of a larger Bates experience,” Schwartz says. Recent projects have included vegan trends and a scholarly paper by two faculty members who investigated the college’s 2009 H1N1 virus outbreak. A recent senior’s thesis compared traditional food thermometers to a newer style, specifically looking at their self-sanitizing capacity to prevent bacterial and allergen cross-contamination. “We found out that the traditional, and much cheaper, style is more effective at preventing cross contamination,” Lacey says. The old Bates dining operation in Chase Hall was cramped and outdated, and the chefs did their work far away from — and two floor levels below — students. Theriault spent his first 19 years at Bates working in the basement of Memorial Commons. Now, at the Bobcat Bar, he gets a chance to talk with his diners. 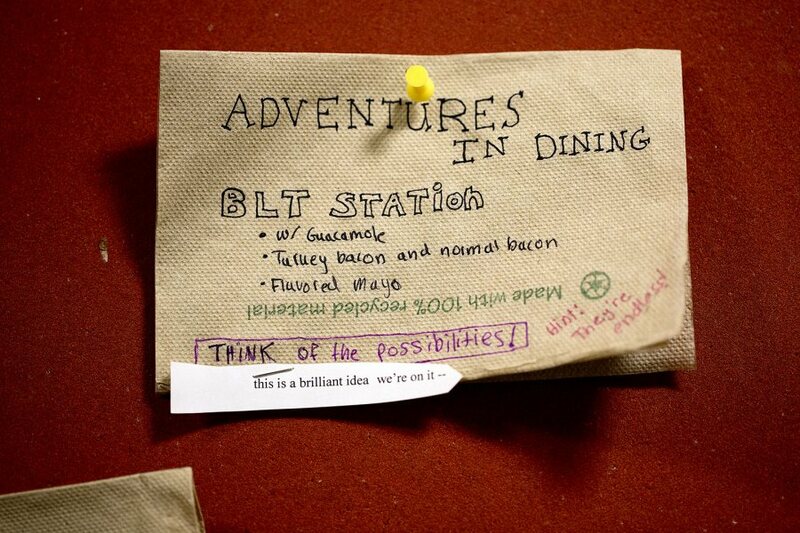 For students increasingly curious about their food, this has been a boon for Bates, and for the Dining Services chefs. It’s more than just a service relationship where students grill chefs on what’s in the sauce. Even before Bluto piled his tray high with foodstuffs in Animal House, the tray has been a symbol of the college dining experience. But trays are on their way out. As Bates students take more ownership of their dining experience, they treat each serving like a course in a restaurant. Bates students are savvy about what they want to create by mixing and matching items from several platforms. The most popular foundations are pita pockets, bagels, tortillas, and wraps. What emerges can be anything from bruschetta to a strawberry tart, or almost anything with pesto on it.